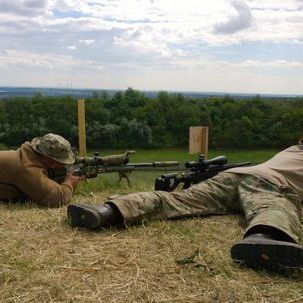 The Sniper World Cup is an annual ‘invitation only’ shooting event open to Police, Military, government agencies and invited guests from around the world. In recent years Great Britain has been represented at the Sniper World Cup by One team or, on occasion a single shooter pairing with a spare marksman from another country to form a mixed nationality team. This year we fielded two teams of two men, the largest UK team so far. One team was comprised of Mike Hattwig and Paul Ratcliffe, the other, myself and Rob Hunter, all keen Diggle competition shooters. 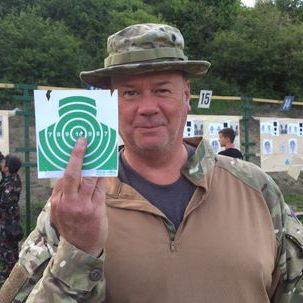 Rob being a veteran of this and other international comps acted as team captain and had already introduced us to some of the challenges we’d face in the comp by setting similar courses of fire during the tactical shoots he runs at PSSA Diggle ranges, Oldham. Now I can’t tell you what the perfect start to a competition is but I can certainly give you an accurate description of an imperfect start. A four hour drive to Gatwick, then two hours of sleep followed by a group of airport staff so unfamiliar with the process of checking in firearms that they couldn’t process us in time, resulting in us missing the flight. After a conversation with a helpful customer services manager we were routed to Hungary via Venice, albeit after twenty hours of waiting in airports, security checks, paperwork and travelling (Time which our fellow competitors spent at the range having a practice and zeroing day) Not ideal, but this being team GB, upper lips remained stiff at all times! A late check in to our hotel in Budapest (around midnight) and a Six o’clock start for breakfast the next morning coupled with the events of the previous thirty six hours or so, revealed one of the first challenges we’d face throughout the event. Sleep deprivation. And none of us had any idea how much more intense this challenge would become. After a fulfilling breakfast we jumped on the coach and made our way to the police range facility on the edge of the city. A heavy but brief downpour aligned itself neatly with the opening ceremony but didn’t dampen the welcome given to the competitors by Hungarian Police and Military top brass. Besides, we shoot at Diggle and although it may have been a torrent to some of the competitors from warmer climates, we barely noticed it! With the formalities behind us it was time to get down to it and, mercifully the first course of fire was nothing too complicated. Shooters were divided into three relays comprising of forty four shooters (twenty two teams) and each relay took it in turns to line up and shoot a fairly standard black and white ringed target, approximately 18” in diameter at 465 yards. We had three minutes to fire just seven rounds from the prone, supported position, the only real challenge being the noise and concussion from the other 43 rifles, almost all of which were fitted with a muzzle brake and in very close proximity to each other. This proved to be the most generous time limit and the largest target we would see for the next three days. All four of us were able to get good data from this stage as the light was good and due to the low recoiling nature of the 6.5x47 cartridge which all four of us were shooting, we could see our bullets heading down range and any bullet holes which ended up in the white portion of the target. We then made our way to the next shooting area where two new dynamics were added to the mix, namely awkward shooting positions and stress. The positions included shots taken with the rifle on a 90 degree cant, shooting from sticks, lying prone on an uncomfortable pile of rocks and, last but not least, the infamous ‘Karma sutra’ where your must use your partner as a shooting platform. This is where Rob’s competition training came in handy, most of these techniques had cropped up in tactical comps at Diggle so we were all well equipped to tackle these shots and, sure enough our scores were good across the board. These shots were taken from various distances from 137 to 341 yards and the R.O.’s added a large element of stress by moving the firing line back as soon as a course of fire was finished. This meant we had to grab our gear and retreat to the next distance at their pace as they would brief the next stage when THEY got there, not when WE got there, so no time for head scratching or ‘what ifs?’ After a quick brief we were given just one minute to prepare for the stages, this time included loading magazines, deciding on an elevation and wind call and any stage specific strategy. They would start the brief and indeed the stage regardless of whether all shooters were ready, if you missed it? Tough luck. This is done deliberatley, speed and attention to detail really ramps up the pressure to get the correct information down in your log book then formulate a plan, execute it and move on. The next shooting area was a real mixed bag. From crawling to the firing point to holding your rifle above your head in a stress position before the stage began, they threw all kinds at us here. 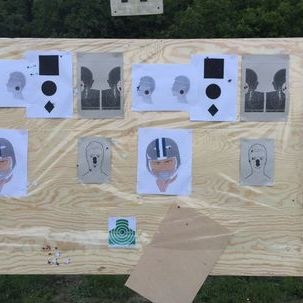 One stage in particular required us to take six offhand shots in 100 seconds, two from sitting, two from kneeling and two from prone at three different targets 126 yards away. Robs ability with a sling shone through here as he was the only one of all 132 marksmen to achieve a maximum score on the stage. Designing innovative courses of fire can be difficult, especially when there are moving parts on the target but the organisers did a great job with a simple mechanism on one of the stages. A small ceramic disc was captivated by two screws into the target backer. It was attached via a piece of string to a wooden board concealing a small inward scoring target. When the disc was broken the string tension was released, the board fell away and the target was revealed. This was not an easy shot as the disc was just 1.5 inches in diameter and 333 yards away. To complicate things we were only allowed four rounds of ammo between the two of us, we could divide it however we liked as long as we each took at least one shot. We could see my fall of shot from the previous stage on an adjacent target and it looked spot on so we decided I’d shoot first. However, after taking the first two shots and spending a while inspecting the target for fall of shot, the disc remained intact and we were none the wiser about an impact location. It was over to Rob and he drilled the disc with his first shot! With the clock ticking he wasted no time in sending his next one towards the newly exposed target. It wasn’t until we finished the other stages on this range and moved forward to check scores that we found out what had happened. My two shots were windage perfect, side by side an inch low of where the disc was placed. On any other day they’d have been great shots. As we already knew Rob hit the disc with his first shot but when we looked at the scoring target we were amazed. It contained a spectacular Bullseye, dead central in a scoring ring the size of a five pence piece! Needless to say he was a happy boy and had added a healthy score to our team tally. Not only that but he’d rescued us from a minus score as this stage resulted in a penalty for any team not hitting the disc, a fate suffered by nearly half of all the teams. The so called ‘desert’ range was the next stop, as you might expect the ground surface here was sand rather than grass. With the light fading fast we were again tasked with offhand shooting although, this time at much closer distances starting right in at just 16 yards standing. Not ideal when your minimum scope magnification is x10! This area was concluded with a prone stage at 75 yards which was an absolute nightmare! The light had almost completely gone by this point and acquiring the target was a challenge in itself. Then the foghorn sounded to note the start of the Course of fire and all hell broke loose. Over forty shooters let rip at once with their muzzle brakes just inches from the dry sand. The already terrible visibility got much worse as sand was blasted in all directions. It got everywhere including into my eyes and more importantly into my action, which felt gritty thereafter. As I took my last shot I was hit in the face with an empty cardboard ammo box which had been launched my way by a Latvian .338 muzzle blast about ten feet away! No harm was done and we had a good laugh about it. Spirits were high now as it was time to return to the hotel and get some much needed sleep.............right? As it turned out, the organisers had planned a night shoot for the second night, but after keeping a keen eye on the forecast they decided to move it forward. At this point I couldn’t tell if my eyes were stinging through lack of sleep or from the previous sand blasting they’d received, either way we tried our best to make the most of a short break from shooting while the organisers set up the next stages. The night stages could only be shot one team at a time for safety reasons, so while we waited to be called forward we got something to eat, prepared our kit and finally got to sit down for a while. The smarter ones took the chance for some sleep too. The first night stage had numerous elements to be dealt with, visibility being the most obvious for several reasons. There were three steel targets which, at first glance looked large enough. However the plates had a small windowed ‘hit’ section (2-3” approx.) with a spring loaded steel within which would rock back and then reset to indicate a hit. Initially there were two contrasting colours for the front plate and the ‘hit’ section, but by the time we shot there were so many impact marks on the target that it was very difficult to make out the aiming point. These targets were illuminated by a small spot light on the ground in front of each one which meant the rest of the range was in total darkness. The only other light source was the continuous blue flashing light from a police van parked off the right hand side of the range, almost certainly in an effort to create a constant irritation to the shooters peripheral vision. In addition to all that we were told we couldn’t use torches at the firing point once the stage began and that we had to shoot alternately with our teammate, all 6 shots to be taken in 90 seconds. We were told the distances to the targets in the brief (340, 400, 450 yards) so we decided the way forward would be to adjust our scopes for the first distance and then just remember how many clicks of elevation adjustment were required between shots, as we knew there wasn’t enough light at the firing point to be able to see our scope turrets. Despite the strategy Rob and I both missed all three shots on that stage, but we were encouraged by the ‘clang’ of steel reporting to us on all six shots that we weren’t missing by much. The next stage was a carbon copy but with slightly different target distances and the added challenge of a steeply slanted firing point making it difficult to steady the rifle at the rear. Weirdly we did much better here, both scoring two out of three hits. Later on, a quick look at the score sheet eased our minds with at least half of all the teams scoring zero on one or both of these stages. The night shoot was concluded by a very simple stage, a 54 yard single shot at a ping pong ball illuminated by a strobe light. 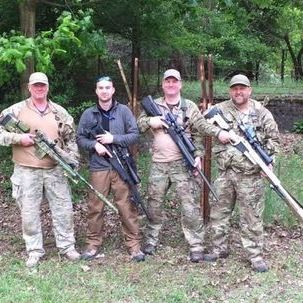 It was an easy prospect for our custom rifles and handloads, and all four of us hit it. The time was now approaching midnight but because we were teams 17 & 18 out of 66, it would take a further four hours for all shooters to complete the stages before the coach would head back to the hotel. We got to bed at 4am and I’d already decided to skip breakfast in favour of an extra half an hour in bed, my alarm was set for 06:30 I remember lying down and trying to figure out how many hours sleep I’d had in the last three days but I was asleep before I could do the maths. The following morning the coach departed the hotel fifteen minutes later than scheduled in order to accommodate tired competitors (fifteen hours would have suited us better!) We were heading to a military training facility a little more dynamic than a normal firing range. An abandoned rural village set up with different types of buildings, roads and pathways scattered around between plenty of thick vegetation and substantial tree lines. There were no large open spaces, so we already knew that distance wasn’t going to be the challenge here. Each competitor was handed a large carrier bag full of food for the day and sent off in the direction of the first stage. All the stages on this day were shot one team at a time which took away the stress of attempting to strategise in a very limited amount of time. We even had the luxury of spectating those who went before us to see how they tackled the stages. However one difference from the previous day was that none of the targets could be seen from anywhere other than the shooting position, so the first time we would see the target locations would be through our scopes with the timer ticking. A mock machine gun nest was the setting for the first stage of the day. A ‘U’ shaped sandbag wall, just big enough for two people faced the target, 131 yards away. 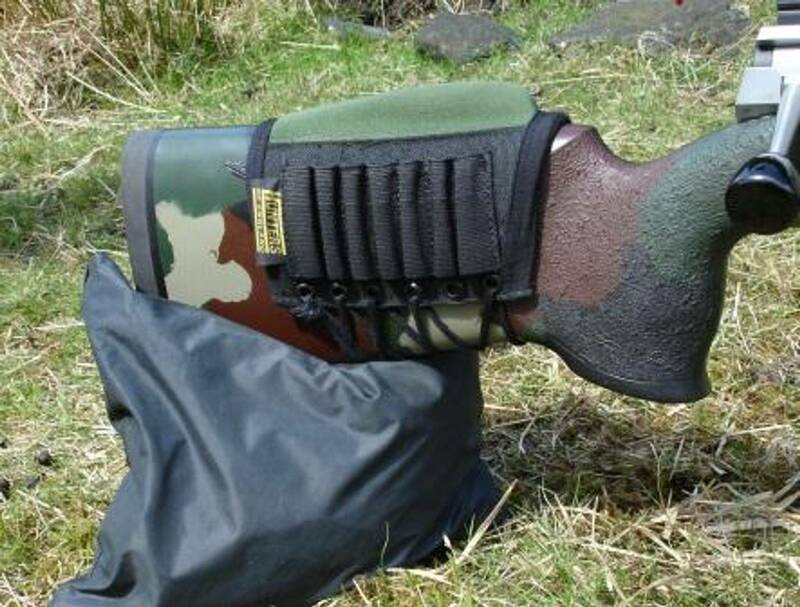 The front sandbags provided decent support for both shooters but only the man on the right could make use of the side wall to steady the rear of the rifle too. Some competitors attempted to shoot left handed in order to make full use of both side walls of the nest, others quickly switched positions so both could use the favoured right hand side, but this technique would put you dangerously close to the time limit. To add more difficulty the organisers had filled the floor of the nest with spent .50BMG cases to reduce comfort and stability under foot, but it failed to scupper Mike and Paul as they were the only one of 66 teams to achieve a maximum score on the stage. The next stage saw competitors standing by a large military transport truck which was facing downrange. Upon the starting signal, the shooters would climb up onto the flat bed of the 5 ton truck at the rear, advance to the front and use the roof of the cab to steady the rifle and take a shot each. Then they would make their way back down and lie on two beds (minus the mattress) which were positioned in front of the truck and take two more shots each, all within a tight time limit. The targets were only 2” square and 320 yards out. Although the shot from the truck was taken about five yards further back, the shooting position was elevated 10-12 feet so we surmised that any elevation change between the shots would be negligible. Upon completing the stage the R.O. congratulated Rob and I on the highest score for that stage so far. The glory was short lived however as squad mates Mike and Paul ran the stage immediately after us, equalling our score but beating our time. 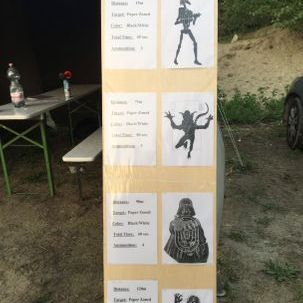 In fact, only the Hungarian police team on their home turf managed to top their effort. With the adrenaline pumping the lack of sleep certainly wasn’t affecting Mike and Paul too much. 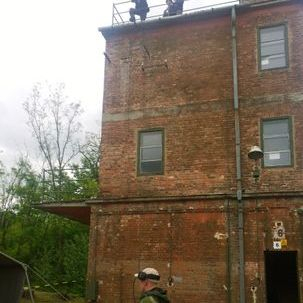 As we rounded the corner to the final stage at this facility, we were greeted by a three storey tower with R.O.’s standing both at the base, and on the roof of it. ‘This can’t be good’ I remember thinking to myself. Predictably enough we faced several challenges here. The run up six flights of narrow stairs complete with slung rifle being the first. The elevated pulse and adrenaline that went with it being the second. Then there were the varying target distances (330 down to 40 yards) and the hugely different inclinations of between 30 and 80 degrees, the closest target being a clay pigeon about 15 yards from the foot of the building resulting in the steepest downhill shot I’d ever taken. Also there were eight targets and only eight rounds of ammo were permitted. And of course, the ever present time limit ensured that anyone ambling up the stairs would run out of time. It was a tough stage but Rob and I managed to hit 13 out of 16 targets between us. As we plodded back down the stairs puffing and panting after the stage, the R.O. said we should count ourselves lucky. He had to run up six flights of stairs and then make his way back down again sixty six times that day. And he’d probably had no more sleep than we’d had. A reminder of just how committed these excellent range staff had been throughout the entire event. 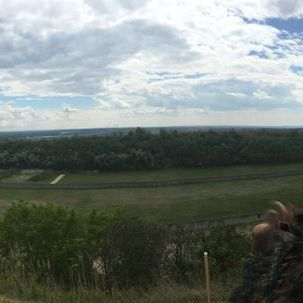 A short coach ride took us to the next shooting area, a huge military field firing range used for vehicle combat training, where tanks go for target practice! I have to say, I was really looking forward to stretching the legs of my rifle and seeing what I could do. Again, these stages were taken on one team at a time and the R.O. informed us things were running behind schedule and it may well be a couple of hours before we got to shoot. That was music to our ears and all the invitation we needed to dump our gear on the ground, lie down and get some sleep. I never imagined it possible to sleep soundly on a firing range but I guess it’s relative to how tired you are because we all managed a pretty solid nap. The five stages here all had a fairly similar theme, at least in terms of targets. It was steel plates all round, distances ranged from about 360-960 yards with the majority being beyond 700. With the exception of one stage where we shot at the same target twice, all the other stages were one shot per target. The order of the day was going to be getting our elevation and wind calls right first time. In that regard, I didn’t make a good start missing three out of three on the first stage. I was gutted, but Rob warned me not to dwell on it, rationalise it and move on. It was good advice and the only thing I could come up with to explain the misses was too much windage, so from then on I made the decision to zero my windage turret, put away the anemometer and rely on instinct and environmental cues and ‘aim off’ accordingly. It worked. Just as I was about to pull the trigger on the first target of the next stage, I noticed floating seeds drifting across the range from left to right about 50 yards out, all the way to the target at 475 yards. It was contrary to the wind direction at the firing point. I quickly adjusted my point of aim just off the left hand edge of the target ‘BANG’.......’CLANG’ my hunch about getting my windage wrong on the previous stage was confirmed. We lay prone on top of an APC during the next stage in which we were tasked with engaging three targets, nearest to farthest. Failure to engage in the correct order scored zero, we also had to take our shots alternately in order for the spotters to be able to identify hits, misses and which shooter they belonged to. It was immediately obvious which target was the nearest, but the lie of the land made it difficult to call the others so, as Rob shot the first I pinged the other two with my rangefinder, then took my first shot and told Rob which was his next target. It worked well as we both hit all three targets, team work and good communications were the key here. 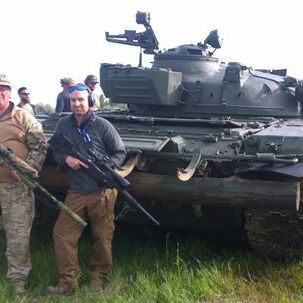 Other highlights from the day included shooting from prone on the front of a T72 tank (not something you do every day) and finishing the days shooting by hitting the longest target in the competition (961 yards) with one shot. I was very pleased with that, especially considering I only had ‘real world’ data out to 600 yards as the rifle had been away for a re-barrel, and I’d only had it back for a fortnight before the comp. Probably the best highlight of the day? We were tucked up in bed before midnight! The final day of the event was a leisurely affair which was a bit of a shame as we were well rested and just hitting our stride. There were just four short stages to shoot including the only moving target in the competition. It was a team event in which the first shooter would engage a small static steel plate at 84 yards which, if hit would release a small trolley with a target attached. The trolley would appear from cover, run down an angled track for about 15 yards before disappearing out of view again. Robs job was to hit the steel trigger plate, which meant it fell to me to have a crack at the mover. I’d shot moving targets before and at longer range too, but never anything this small, the target was about 3” square. Rob did his part, hitting the small ‘T zone’ kill shot plate and sent the mover on its way. I took my shot relatively quickly before the trolley could pick up too much pace and make the shot harder than it already was. It felt like a decent shot and a radio transmission from the butts crew confirmed a near perfect scoring hit on target. That was one of the most satisfying shots I’d ever taken and a later glance at the scores showed just 13 teams managed to score on the mover. The competition was concluded for us with a very tricky downhill shot on a miniature clay pigeon at 329 yards. The task was made more difficult by the fact that the shot had to be taken in a five second window when the RO sounded a horn. Despite accidently having an empty chamber when the horn sounded, Mike kept a cool head, cycled his bolt, got back on target and broke the clay, a claim that could only be made by 22 competitors. That evening we made our way to the prize giving and were more than pleasantly surprised to learn that Rob had placed third in the individual standings, and he and I had also placed third in the military team standings. We were happy with that and Mike and Paul also did very well placing 19th well up in the team standings against the toughest competition any of us had faced before. The Ukrainians sent just two teams to the event (one Military, one Police) and proved conclusively that quality beats quantity, winning the Military teams class and coming 3rd in the Police teams class. One of their marksmen also topped the overall individual scoreboard and earned the title ‘Master Sniper’ All that was left to do was to enjoy a slap up meal with a free bar and to finally get a chance for some friendly chat with our fellow competitors. It was a superb three day shooting experience which I hope to repeat. 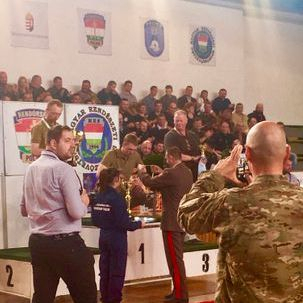 Thanks must go out to all those involved with the organisation and running of this excellent event and to the Police and Military authorities in Hungary who welcomed competitors from all over the world. Thanks also to Rob for forming us into something that resembled a semi organised squad and for all the advice and experience he shared with us. And one final personal thank you to Dave Wylde of Valkyrie Rifles for building the rifle that brought home a trophy on its first competitive outing. 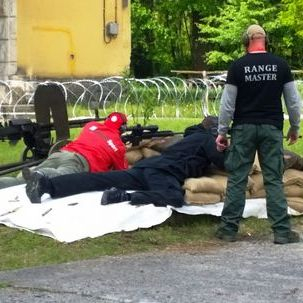 PS i should like to add the following its nice to publish a piece on my site not written from my own personal point of view and id like to thank Mike for a well written and balanced take on the whole experience of one of the toughest sniper competitions in the world . i would also like to say a huge thank you and well dome to Mike Mc, Mike H and Paul R who made up team GB such that it was, and not only represented there home club PSSA admirably and were great ambassadors for team GB also.